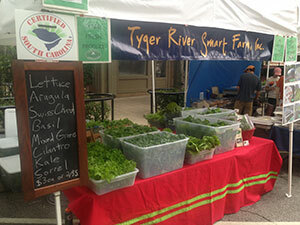 Tyger River sells at local farmers’ market. Sometimes what appears to be a detour ends up being the right road all along. Ryan Oates owns Tyger River Smart Farm, a hydroponic farm in Duncan, South Carolina. He grows a variety of lettuces, chard, kale, and basil in his 28 x 45-foot greenhouse that he sells to farmers markets, restaurants, and retailers. New to the industry and a first-generation farmer, Oates harvested his first crop in 2013. Despite being the first person in his family to farm, Ryan Oates is no stranger to plants. He studied plant biology at Clemson University, even doing crop research at Clemson’s Genomics Institute. However, after graduation, he left the plant world for a while to work as a financial planner in his father’s business. Then he worked for two different cabinet companies while he refurbished an old house. The skills Oates acquired in his various jobs eventually came in handy. In 2012, Oates met a successful hydroponic grower. Intrigued by the idea of indoor farming, he decided to install a system in an existing greenhouse behind his parents’ home. His mother, a gardener and retired schoolteacher, had built the greenhouse originally, but she was no longer using it. Oates investigated potential crops and hydroponic methods and eventually installed an NFT (Nutrient Film Technique) system, a soilless technique that bathes the roots of the plants in water infused with carefully monitored nutrients. Finding that he enjoyed farming, Oates decided to start his own business—combining his knowledge of plants, his financial skills, and his ability to work with his hands. Though he did do some upgrades to the greenhouse, starting with an existing property benefited his bottom line and allowed him to avoid going into debt to start his new enterprise. Not that there weren’t unexpected costs. A lack of adequate lighting at first decimated a crop of basil, and Oates had to scurry to install supplemental lights for his plants. Another time the power went out for two hours during the hottest part of the day, which stopped the flow of water and wiped out sixty to seventy percent of his crop. He has since installed a generator. “There’s been quite a bit of trial and error,” he says. Plants and technology come together in Oates’ greenhouse. Water is stored in a 600-gallon underground tank. Before water is pumped into the channels containing the individual plants, it is treated with a special nutrient solution. A computer monitors and controls the concentration of nutrients so that the plants receive the exact amount they need for healthy growth. The water flows into the channels over the plants’ roots, then the excess is collected and returned to the underground tank—a closed loop system that wastes neither water nor fertilizer. During the peak of the season, Oates harvests around a thousand plants a week, but he continues to produce plants all year round. Since starting his operation, Oates has marketed directly to customers through farmers’ markets in his area. He also participates in several local food exchanges, and he sells his fresh produce direct to restaurants and grocery stores. He finds that the most effective marketing comes through word of mouth. Oates hopes to reach new customers in the next 5-10 years by moving to a new location and adding new types of hydroponic systems to grow tomatoes and cucumbers. Oates has advice for anyone new to hydroponic farming. Even with help from the manufacturer, however, in the end it is up to the individual farmer.